Apple's online store went offline yesterday while the new addition was made, sparking rampant speculation about what new product the company was now releasing. Wired referred to this little game played by the tech community every time Apple updates its website as "one of the high-tech universe's favorite parlor games." 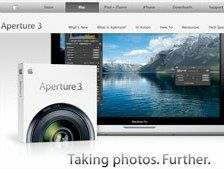 However, if you are an Apple using amateur snapper then the news will be of interest, with Aperture 3 including over 200 new features, with better organisation of your photo libraries being one of the key new selling points for the photo editing package. Aperture's 'Faces and Places' feature has been expanded to 'Faces, Places and Brushes' to let users paint over their pics to touch them up a little, the slide show features have been massively improved and there is now face recognition built-in. "I am beyond impressed with the massive changes made in Aperture 3," National Geographic photographer Jim Richardson said in the release.